Remember the NLRB poster requirement that was to take effect November 14, 2011? But it got postponed until January 31, 2012? You'll never guess what happened! Yup, postponed again. Earlier today, the NLRB pushed the implementation date back to April 30, 2012... for now. 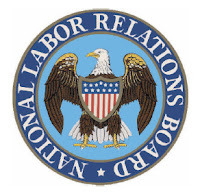 See the NLRB press release here. Image: NLRB logo used in commentary on NLRB - Not official use.